Asbury United Methodist Church > Bible Reading > Asbury Kids Valentine’s Party! Wednesday, February 13th at 6:30pm in Room 121 and the Contemporary Worship Center for Asbury Kids 3rd through 6th grade. 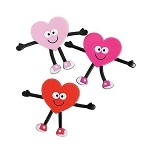 We will have a lesson about God’s Love, Valentine goodies galore and dancing in the Contemporary Worship Center!!! This is a time you will not want to miss!